There is an increasing trend taking root around the world of disrupting communications services in periods of protest or unrest. This is both illegal and dangerous, and can’t be allowed to continue. Using a “kill switch” to cut off communications is a blunt-force instrument aimed at suppressing free speech and denying access to information. The impacts of a shutdown are widespread under any circumstances — from economic losses, to hindered access to critical health data, to disrupting education, and beyond. And in times of unrest, shutdowns put people in physical danger. Many or all in the affected area — regardless of their participation in the targeted protests — are not able to connect with friends and loved ones or access breaking news in a volatile environment. Shutdowns also make it very difficult to hold those who perpetrate violence accountable, whether they are police, government security forces, paramilitary groups, or others who would inflict human rights violations on civilians. Further, shutdowns impede democracy. Peaceful assembly and protest is a right protected under international law, and it is a critical tool for citizens to advocate for change — particularly in oppressive environments. Shutdowns are also increasingly being deployed leading up to and during elections, impeding citizens’ ability to participate meaningfully in the democratic process. Stopping protests is the number-one reason governments shut down the internet worldwide, according to the #KeepItOn campaign’s STOP Shutdown Tracker. In just the past month, we’ve seen multiple internet shutdowns and witnessed their impact in countries that are quickly establishing themselves as repeat offenders. January 6th marked the 100th day of the most recent internet shutdown in Anglophone regions of Cameroon, where tensions over the region’s insufficient support from Francophone national leaders and a lack of autonomy in local governance have grown to a fever pitch over the past year. Anglophone Cameroonians spent more than half of 2017 under some form of internet shutdown, including a complete blackout from January to April. Cameroonians’ lives have been impacted in every way imaginable, disrupting everything from small business operations to education to access to health services. 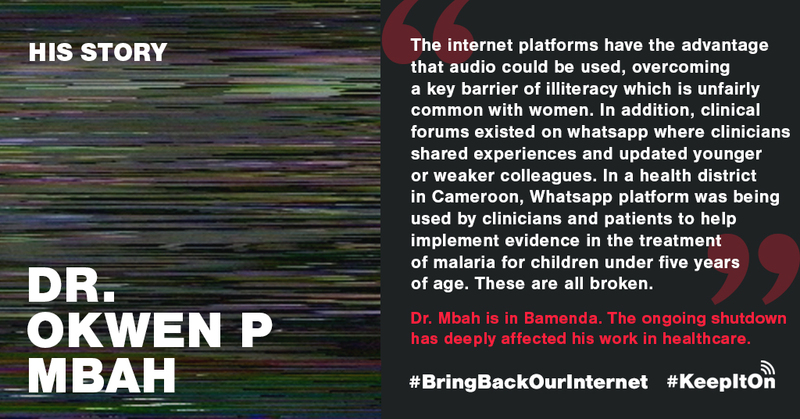 You can support local activists in their fight to #BringBackOurInternet and #KeepItOn by taking action here. In the Democratic Republic of the Congo, Catholic church-goers organized demonstrations in spite of a police ban on December 31st to protest President Joseph Kabila’s refusal to leave office since his term ended in December 2016. In response, on December 30th, the DRC government ordered a nationwide shutdown of internet and SMS services. During the shutdown, security forces reportedly shot and killed at least seven protesters and arrested dozens more. In August 2017, when similar protests gained strength following Kabila’s announcement that he would not give up power at the end of the year as scheduled, the Congolese government ordered telecoms service provider Orange to slow down internet speeds to make it harder to share images on social media. And in December 2016, in the weeks leading up to the original end of Kabila’s term, the government blocked access to social media sites altogether. The Kabila administration’s comfort with using network disruptions to stifle dissent as it tightens its grip on power is worrisome, to say the least, and these instances raise a red flag for other human rights abuses. The same is true in Ethiopia, where the government has routinely restricted internet access, in whole or in part, amid protests and subsequent crackdowns by security forces. Most recently, starting on December 12th, Ethiopians reported varying degrees of disruptions to web services including Twitter and Facebook, amid a wave of student protests triggered by the killing of at least 15 civilians by security forces. And in Iran, where the largest anti-government protest movement since 2009 has been sweeping the country, the authorities have ordered a national block against certain social media platforms being used by organizers, including Telegram and Instagram. There have also been reports of complete loss of internet access in certain parts of the country. For more details on how these blocks are being implemented, and what they mean for the people of Iran, see this post. The #KeepItOn Coalition is a global movement of more than 150 organizations from 60 countries fighting to challenge governments who shut down the internet, establish safeguards that prevent shutdowns from occurring, and empower users at risk to circumvent them when they do. Visit accessnow.org/keepiton to join the coalition and download the action toolkit. You can also share this post with your social networks to raise awareness about internet shutdowns and strengthen to global movement to stop them. Together, internet platforms and telcos can publicly critique government actions during shutdowns, like the Global Network Initiative called out Iran. Business leaders like Mo Ibrahim speak out against shutdowns, and should be encouraged to continue. International financial institutions like the International Monetary Fund (IMF), World Bank, and development banks, should consider how their projects — like this $666 million IMF loan to Cameroon just months after its first shutdown — could promote uninterrupted and universal internet access. Telcos lose profits during shutdowns, a fact they can leverage in judicial, indemnity, and arbitration lawsuits against governments. Additionally, telcos can make strong arguments to regulators, and contribute to reports on the economic costs of disruptions. Government officials can hold hearings and meetings between civil society and regulators to prevent crises and communications breakdowns. They can also make public, unwavering commitments to respect rights and #KeepItOn. Contact the Access Now Digital Security Helpline for 24/7 support, available in eight languages, to identify alternatives for secure communication, explore circumvention possibilities, and learn about the best ways for you to protect yourself online. Email evidence of the network disruption to shutdowns@accessnow.org. Whether it’s a notice from your service provider about the blocking, a screenshot of a 404 error for a website you can typically access, or statements from a government official saying they plan to implement an internet shutdown, we want to hear from you. It will help to update the STOP Shutdown Tracker, and to strengthen the legal fight against network disruptions around the world. Share your personal story of how your life was impacted by a shutdown. Documenting the real-life impact of internet shutdowns helps us to fight back against government arguments that these shutdowns are “harmless,” and to encourage telcos, policymakers, and global activists to do everything in their power to prevent internet shutdowns in their communities.